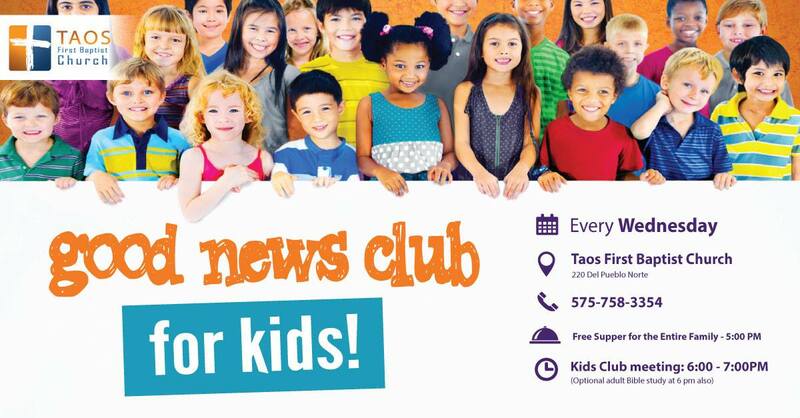 First Baptist Church of Taos - NEW: Weekly Kids Club! Something new for families! Join us for the weekly Good News Kids Club. It all begins with a free supper for the entire family, at 5:00 PM. This supper, served in our Fellowship Hall (behind the main auditorium) is totally free. Enjoy a home-cooked meal and meet new friends. Then, from 6:00 – 7:00 we will have a Kids Club, complete with Bible learning activities, crafts, games, and more. Also at 6 is an optional Bible study for adults, which meets in the Auditorium. No registration is necessary, just show up at 5:00 PM for supper or 6:00 PM for the Kids Club!